FREE over 200 Mini-Love-Lessons touching the lives of thousands in over 190 countries – worldwide. Synopsis: This Mini-Love-Lessons presents some amazing communication research that has been found to prevent and impede infidelity in couple’s relationships. 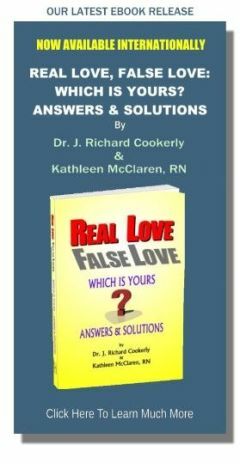 It reveals ‘expressional love’s’ often unrealized pro and anti-love infidelity effects and how to best use this knowledge (Want to tell someone about this one?). Love research is wonderful! Loveology, or the scientific study of love, and its discoveries are starting to be such a great help to so many. Here we present a finding that can greatly assist couples avoid the betrayal of infidelity and the agony it so often causes. This discovery first was made in an area sometimes called ‘expressional couples communication’. You may know this extremely important area by its other name, ‘nonverbal’ communication. Note that extensive previous research repeatedly has showed the nonverbal to frequently be more important than the verbal in love relationships. (See Communications section in the Subject Index of this site ). Your face may be saying a lot more than your mouth. That can be true even if you are quite verbose. Furthermore, your gestures and posture changes may be speaking volumes that you are consciously unaware of. Your tones of voice even may be completely contradicting the words coming out of your mouth. These are the elements of expressional communication. Without knowing it and entirely subconsciously, it is possible for your expressional communication to be making and sending messages that will have a very anti-love or pro-love, relationship effect. Your words may say I love you but expressionally you may be communicating to your beloved that you are withholding giving or showing them love. From that they could interpret that they might as well go look for more and better love somewhere else. Sadly this happens in many couple’s relationships. Your facial expressions, your tonal expressions and other voice modulations, your gesture and posture expressions, they all make up your expressional message-making. Whether you consciously know it or not, your expressional message-making always is going on when you are with your beloved. It also turns out to be extremely important to the strengthening or weakening of your love relationships and the chances for infidelity to be encouraged or discouraged (See the “Infid. and Love” Mini-Love-Lesson). Also extremely important in expressional communication is how often you send what can be called love-positive messages compared to how often you send love-negative and love-neutral messages. 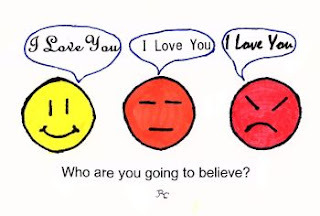 Note that love-neutral, expressional messages usually are interpreted, at least mildly, as love-negative. Examples of love-positive, expressional messages are a wide range of different kinds of smiles, especially those that are very tender, accompanied by approval nodding, looks that are attentive and caring with good eye contact, friendly winks, reflective facial expressions conveying that you are emotionally congruent with a loved one, and the like. Love-negative, expressional messages include scowling, shaking your head “no” especially while frowning, eye rolling, looks of contempt, moaning with disapproval, hate-staring, fist gestures and of course angry, demeaning voice tones. Now, ask yourself how frequently do you think you may be sending both love-positive and love-negative, expressional messages and what effect do you suppose they are having? (See the Communications section in Subject Index ). Here is the astounding, essential and ever so useful discovery. The ratio of expressional, love-positive to love-negative messages has been found to strongly indicate and influence whether or not infidelity will occur in a couple’s relationship. If a couple consistently averages four or more love-positive, expressional messages to every one love-negative message, infidelity becomes highly unlikely. Thus, it may take four loving smiles to counter an anti-loving scowl, four happy-toned, brief statements with good eye contact and a friendly look to counter the anti-love effects of a hatefully delivered sarcasm – and so forth. The more a couple drops below the 4 to 1 ratio the more they are likely to be less happy and have more troubles, but in regard to infidelity they may still be somewhat safe. However, if they drop below a one-to-one ratio of love-positive to love-negative, expressional communications, the chances for an infidelity occurring increase drastically. In other words, if every smile is matched by one or more frowns, and every happy sound is matched by one or more unhappy sounds, or if every open arms welcoming gesture is matched by one or more ‘turning a cold shoulder’ actions, then one of the people in the couple’s relationship, and sometimes both, subconsciously are likely to begin looking for someone else. This discovery and other closely related discoveries have been repeatedly found to be statistically significant, valid and reliable by a number of different research efforts made by various research teams. In research and professional circles, this “four to one ratio” discovery has been called by many ‘ground breaking and highly important. The research sample size is good and with replications it is growing. The methodology is considered quite acceptable and the advanced statistical treatment is considered good. If you are interested in the scientific technicalities involved here, I suggest you start by reviewing the research concerning “Precursors of Infidelity” in the professional journal, Family Process, especially Volume 47, pages 243 to 259. First, let us suggest you take a look at your own behaviors. You may wish to inventory your own love-positive and love-negative, expressional messages you are sending to your beloved and to other loved ones. How often are you smiling and smiling back at those you love? How often are you looking stone faced, or neutral or perhaps even like a grouch, or are sounding and appearing like a critical and judgmental parent? Don’t forget to check out also looking bored and uninterested. Are you sending out sighing sounds of disapproval, short clipped verbalizations that can sound angry, and what about your demeanor expressing superiority or condescension? Do you frequently make loving eye contact and do you turn toward your beloved when they are talking. Expressional self-study usually proves to be well worth it and often is a big aid to making improvements. Second, we suggest you start making improvements experimentally. Maybe start by uncrossing your arms and instead holding them open more to your loved ones. Work to sound like you profoundly love who you love more frequently. Remember, you are going to be helping your love relationship be stronger and more protected against infidelity and other problems by doing these sorts of expressional things. Third, work against being phony as you take these steps. If you feel you are being fake, pause and mentally tap into your love for your beloved. Center your awareness in your love and see if you can come from that love-centered place toward your beloved, (See Mini-Love-Lessons “Love Centering Yourself”). If you think it’s just not you to do more loving looks, sounds, gestures, posture changes, etc. remember this, you already could be subtly pushing someone you love toward the arms of another who may do expressional love better than you. At least that is what the research suggests is all too likely to happen in couples situations. So, why not live by the rule of four positive-love expressions to every love-negative action and, thereby, safeguard your relationship more (Read more about Expressional Love in the Communication section, for example : “Behaviors That Give Love – The Basic Core Four”, “Holding Hands with Love”, “How to Talk Love Without Words”, and several others listed in the Subject Index). Fourth, talk to your beloved about both of you, purposefully examining and improving your love-positive, expressional communications to each other and perhaps to others as well. Working as a team together to improve your love skills is another really good way to protect against infidelity. If you do these things well, it is likely to make you happier and to make your relationship not only better but also better protected from infidelity occurring or reoccurring. Please don’t think that all there is to a good, well protected, love relationship is the 4 to 1 ratio. This is just one factor. It is, however, a much more important factor than many people realize. Lots of other influences can intervene and cause exceptions to the 4 to 1 ratio rule. But don’t count on that. This 4:1 discovery is proving to apply to most couples and other kinds of love relationship too. One big, important factor is the strength of both of the negative and positive, expressional communications. One great big, loving smile may have more positive impact that a short, minor frown. A love-filled, enthusiastic, open arms greeting may outweigh the importance of a person who only briefly turns their back on a loved one. There are other ratio findings of considerable importance for making and creating love-positive messages and relationships. However, the factor of expressional communication is so very often overlooked and so often subtly crucial to the blocking of infidelity and all the pain and problems it causes that it needs special attention. ♥ Love Success Question: If you want more loving sounds, smiles, nods of approval, tender looks or any other expressional communications of love, can you reveal that desire to your beloved and ask for it freely and easily? If not, can you ever so carefully reveal that desire and ask for it?